Hireology has seen significant growth throughout 2018 – we’ve received nearly 13,000 applicants, 7,000 quality candidates and hired more than 100 new employees. 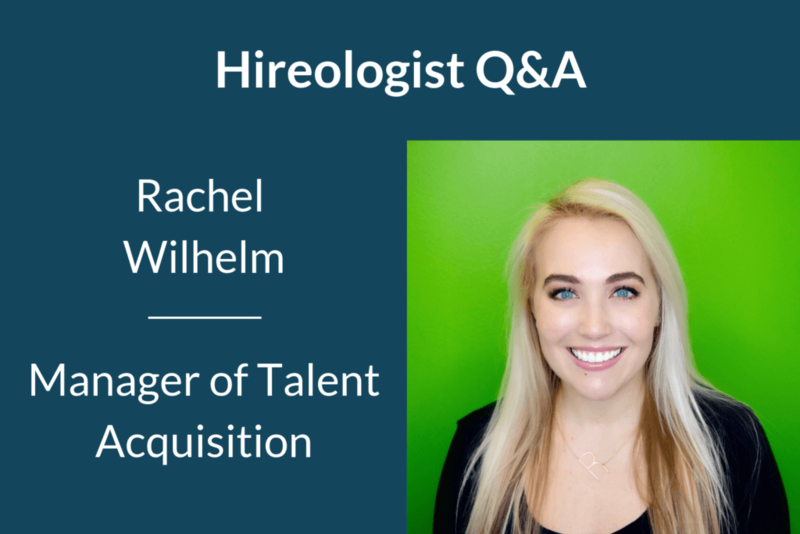 Leading up to the New Year, we wanted to sit down with our Manager of Talent Acquisition, Rachel Wilhelm, to discuss our hiring efforts in more detail, and how we continue to attract top talent in today’s competitive market. See below for our Q&A with Rachel. What are some of the biggest challenges you face with hiring? The applicant-driven economy and the record-low unemployment rate are among our top challenges. The hiring market is so competitive that employers have to go above and beyond the traditional means to find top talent. Even though we have an efficient hiring process in place, Chicago’s competitive market impacts our hiring efforts significantly. We’ve had instances of candidates withdrawing from the hiring process before we could schedule an in-person interview, simply because they received multiple offers from great companies within a matter of days. For example, we recently had a sales executive in for a great first interview and they were off the market before we could schedule the final interview two days later. How do you and other members of our People Team keep the hiring process moving along quickly and efficiently? When a job seeker applies to an open role at Hireology, they are so excited about the opportunity to work here. We don’t want them to ever lose that excitement. Every day that goes by without hearing back, that excitement starts to dwindle. We never want any of our applicants to go two weeks, a month, several months, or more unanswered, as might be the case with some companies. So we like to practice what we preach to our customers by having an efficient hiring process. Either myself, another member of the People Team or a hiring manager personally reviews each resume and we do our best to respond to applicants within 72 hours no matter what – even if they aren’t moving forward with the process. This constant communication with our candidates continues all the way up to their first day at Hireology. We hold ourselves accountable to never leaving candidates hanging and wondering if they will hear back from our team. In addition to building excitement and continuous engagement throughout the hiring process, we try to be as transparent and strategic as possible with our candidates. We understand that if a given role is not a fit, there may be another opportunity in the future and we will continue to stay in touch. An important piece of any hiring strategy is proactively networking. We are constantly searching and passively sourcing for top talent, including building our own candidate pipeline of previous applicants. Given the competitive hiring market, how do you ensure candidates stay engaged throughout the hiring process? Our career site and strong employment brand, including our distinct job descriptions, are what initially get candidates excited to apply. And it’s our interview process that significantly impacts candidates’ likelihood to join the team. We are always quick to communicate with applicants and candidates throughout the interview process, including frequently updating them on where they stand with the hiring process. During our interview process, we provide insight into Hireology and the role, and provide detailed itineraries outlining which team members candidates will be interviewing with before they walk into Hireology. We’ve had a tremendous amount of success with our software’s text messaging feature to confirm candidate interviews and keep candidates engaged throughout the hiring process. To give candidates a true sense of our core values, we “Create Wow Moments” for each in-person interview. Instead of simply greeting candidates at the door, we give them a tour of our office so they can get a feel for our collaborative and fast-paced culture. This also helps calm their nerves before an interview, which is something we’ve all felt at one point or another during the job search. Once a candidate has accepted an offer, our CEO, Adam Robinson, sends each new hire a congratulatory email with his personal cell phone number in case they have any questions before their first day. They also receive a welcome email from the leadership member on their team as well as their manager. What do you think are some of the most important aspects of our employment brand when it comes to driving quality applicants? Candidates who get the most excited about joining our team are motivated by our strong company culture, benefits and growth opportunity. We’re always looking for candidates who want to drive their careers as we continue to grow. This holds true with the number of promotions we’ve had at Hireology this year – we’ve promoted 41% of our staff and are always eager to help employees grow and develop in their careers. As far as our benefits go, we want employees to be motivated to succeed at Hireology while also leading great lives outside of work. We’re excited Hireology has growing families and we recently expanded our medical benefit coverage to help support them. We also offer unlimited vacation and have extensive paid leave for new parents. Hireology takes our core values and company culture seriously. What do you think is the most important interview question to assess culture fit? One question we like to ask every candidate is, “What drives you?” We want to know what incentivizes candidates to get out of bed in the morning and what drives them to achieve their goals. We’re looking for candidates who are results-focused and have a process in place to achieve what they set out to accomplish each day. Everyone who works at Hireology has an impact on the company and we work hard toward achieving the same goals. We look for candidates who have hunger and drive but are able to stay humble and down-to-earth throughout their successes. The New Year is coming up. What do you and the People Team hope to improve about our hiring process in 2019? Leading up to the holidays, we’re not slowing down any of our hiring efforts. A lot of companies pause the hiring process during this time of year because they’ve met year-end budget restrictions, but we’re full-steam ahead and are recruiting for nearly every department. As far as improving our hiring process in 2019, we’ve incorporated one of our core values, “Eager to Improve,” into the hiring process by collecting candidate feedback. We’re always looking to improve the candidate experience and attract more quality applicants by acting on this feedback. In the coming year, we want to be more strategic about our hiring process. We’re always recruiting, and even if we know a role may not be open for two months, we want to start building a candidate pipeline now so we have a diverse talent pool established by the time we open a new position. We’re looking forward to another big year at Hireology with continued growth and new team members who make Hireology an amazing place to work.